Determine your target audience. Find a voice and stick to it. Don’t try to cover too many bases at once — the Twitter audience prefers tailored content rather than generalized, all-purpose tips for everyone. You’ll find the most meaningful connections by keeping it local and positioning yourself as the go-to source in your area with hyper-local tweets. Some examples of great content pieces to tweet about include lists of the best restaurants in town, top local parks, and upcoming events in the area. Bill Gassett is one of the most prominent real estate agents on social media. His bio includes his company name, location, links and some characteristics about his personality. He uses the same profile photo across multiple social networks. Just like in the offline real estate world, appearances matter on Twitter. Choose a high-quality picture that represents you well and be consistent. Use the same photo across all social media as well as on your business cards and listing presentations. Don’t underestimate the power of your bio. Make sure the description is well-written with relevant SEO keywords. Include the words “real estate,” of course, and add your location and something that shows your personality, like a hobby or interest. Additionally, social media strategist Rebekah Radice recommends that your photo, background image and bio match your personality. So if you’re personality is all-business, choose a more professional photo. Want to foster and build relationships with other professionals in the industry? That’s where Twitter shines. 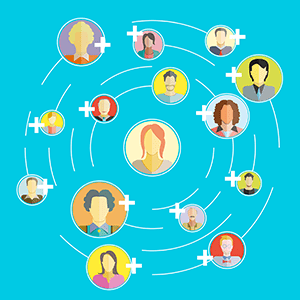 Aside from the value of social proof and the opportunity to serve as a thought-leader in a highly-visible space, relationship-building is where the social network’s strength lies. Click the infographic to see a larger version. Source: WebsiteBox. 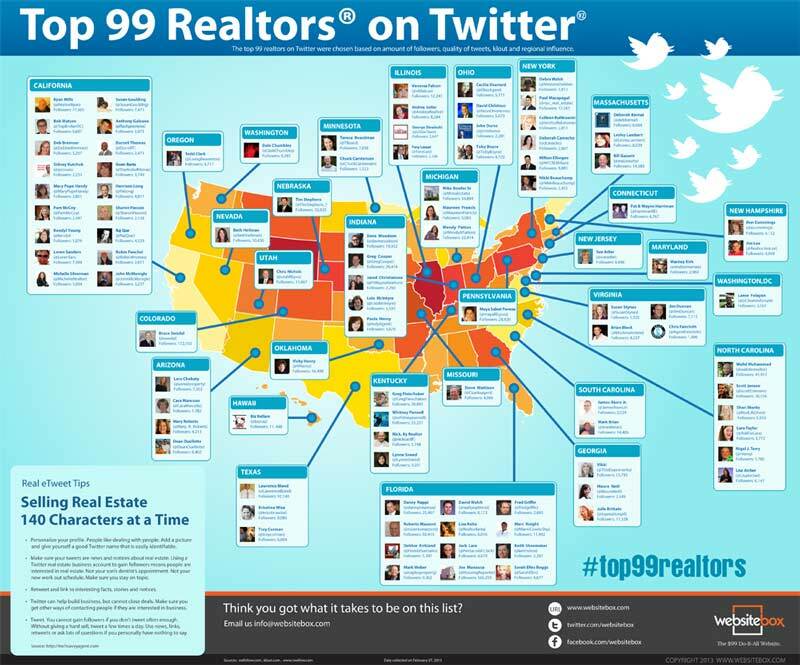 Twitter allows you to proactively reach out to other agents and industry leaders. We can speak from our own experience. When we can’t reach a real estate pro through email or phone, we send them a tweet or a Direct Message (DM), and often receive a response within minutes! Identify suppliers and clients on Twitter, start conversations and promote (retweet) their content. Don’t forget to include their handle (example: @adwerx). Ideally, they will reciprocate and engage with you. Also be sure to follow local real estate companies, known real estate sources, and other reputable real estate agents on Twitter. One way to find them is by using the WeFollow tool. Why? Because they’re annoying and essentially spam. “It’s like walking into a coffee shop and shouting out ‘123 Main Street!’ Nobody does that,” explains Lisa Ludlow Archer with Keller Williams Realty in Charlotte, N.C. Archer recommends that, if you must tweet about a listing, tweet things about the listing that you find interesting. The goal here is to extend your influence and add value. Set up Google Alerts, RSS feeds (our favorite tool is Feedly) and subscribe to key industry websites to receive great content that you can share (see examples below). And of course, if you do your own content marketing on your blog, YouTube, or website, share it on Twitter too. “Be brief, be bright and be gone.” – Marty Boardman, Realtor®, CFO and real estate instructor for the Arizona Department of Real Estate. Listen to what people are talking about. Ian Watson from Agent Media recommends you set up saved search terms such as (apt cambridge) (realtor cambridge) (estate agent cambridge) and check them daily. You can do this by using a service like Twilert. You will be surprised how many people tweet using basic terms like this! Then you can engage with other agents and professionals who tweet about the same things that you’re interested in. It’s simple, but very effective! Monitor the tweets your audience responds to. What’s the point of sending out a tweet if no one is listening? Rebekah Radice suggests using tools like SocialBro and Tweriod to analyze your account and then determine your optimal time to tweet based on the maximum number of followers online at any given time. Ian Watson for these great tips for what to avoid on Twitter. Do not tweet when you have just had a disappointment. Do not tweetwhen you are angry or having a bad day. Do not tweet every single property. Do you use Twitter in your social media strategy? If so, what’s working out for you? 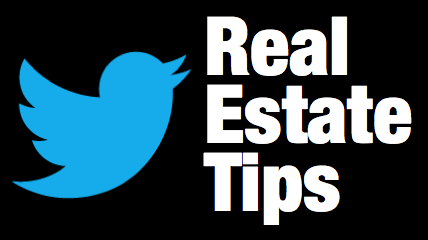 Follow @AdWerx on Twitter for real estate news and tips!